Trillions of pieces of plastic, many of which will last for thousands of years, are floating in the oceans, potentially damaging human health, killing birds and fish, and even adding to global warming. From bottles and shopping bags to microbeads in cosmetics and the tiny shreds that rub off the soles of our shoes as we walk, vast amounts of plastics find their way into rivers, lakes and the sea. Scientists estimate that more than 5 trillion plastic particles are floating in oceans around the world - an amount that has accumulated since global mass production of plastics started in the 1950s. 'One of the potential impacts we are investigating is their impact on the exchange of carbon dioxide at the sea surface,' said Dr Luisa Galgani, from the University of Siena in Italy. 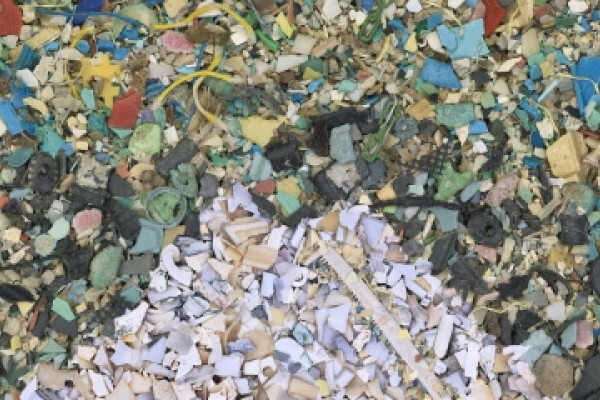 Microplastics can include items such as nurdles - small plastic pellets used in manufacturing plastic products - or fragments of larger pieces of plastic waste, as well as synthetic fibres from clothing and cosmetic microbeads. Dr Galgani is leading the EU-funded POSEIDOMM research project, which is looking at the impact of trillions of tiny pieces of plastic that are floating on the top few millimetres of the sea. The researchers are examining the interactions between microplastics, bacteria and algae, and how microbes colonise plastics in the surface micro layer. It's a vital question as this is the layer that acts as the interface between the water and the atmosphere. 'By looking at the interactions at the surface, we hope to be able to find out how this changes the functioning of this very important ecosystem at the top of the ocean,' explained Professor Steven Loiselle, who is supervising the project at the University of Siena. One of the biggest problems with these tiny pieces of plastic is that they can be ingested by marine organisms and slowly work their way up the food chain, ending up causing health problems for humans. 'They can be transported through the body of an animal such as a mussel, an oyster, or a human,' said Dr Heather Leslie, who is based at the Institute for Environmental Studies at VU University Amsterdam, in the Netherlands. When plastic pieces are smaller than about 0.1 micrometres in size, they are known as nanoplastics and can be tiny enough to enter the bloodstream and even cross the blood-brain barrier. These can cause different problems as they move through the body, such as inflammation, or even tumours, when the immune system goes into overdrive. 'Normally an immune system cell can attack a foreign particle, such as a bacterium, and remove it. But plastic is so persistent that it is able to resist attack by our enzymes,' said Dr Leslie, coordinator of the CleanSea project which has been funded by the EU to study micro- and nanoplastics in the marine environment and take steps to address this problem. Dr Leslie believes efforts such as those in Britain and the Netherlands to ban microbeads in facial exfoliants, bathing scrubs and shower gels can have an impact. But much more is needed. She says that policies against planned obsolescence, disposables, or to encourage green public procurement could have a major impact, and she underlines the need to maximise prevention, rather than to focus on cleaning up pollution.